King Philip V certainly had location in mind when he chose La Granja as his retirement spot. After purchasing the lodge from the Hieronymite monks and adding acreage to the property, he set about having it readied for his retirement. 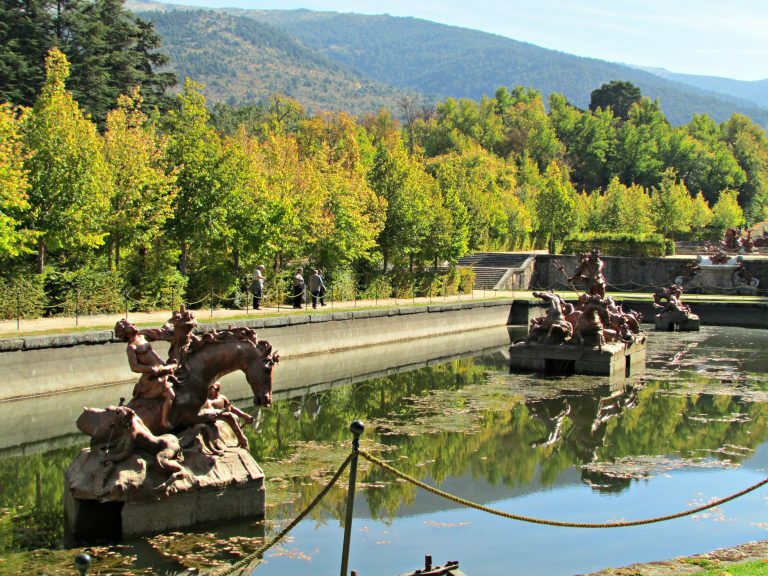 Located in the Guadarrama Mountains, La Granja enjoyed four seasons and had an abundance of water. This was important as he wished to have a garden requiring a lot of water. Philip abdicated in favor of his son who became Louis I and started his retirement. When Louis passed away seven months later, Philip became King for a second time. He decided that La Granja would become his summer retreat. 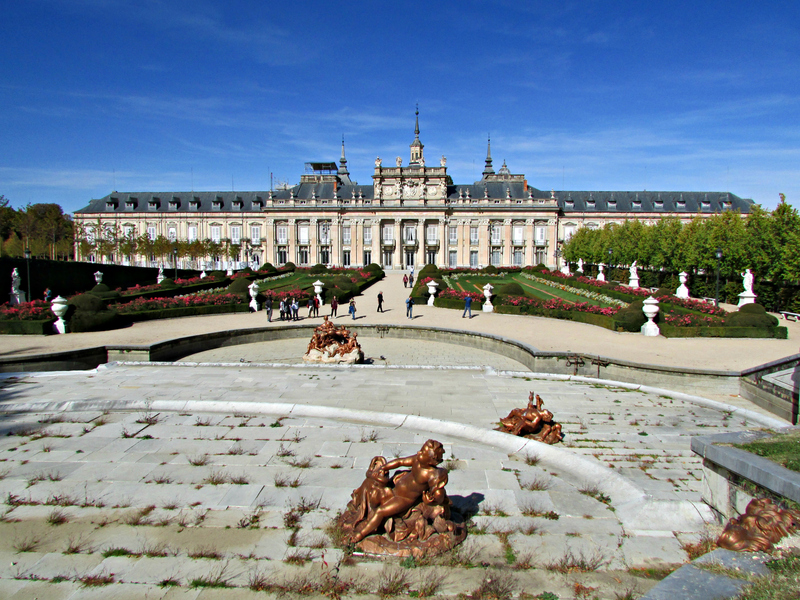 He set about upgrading the retreat for Royal status and established the Royal Gardens of La Granja. After spending the morning exploring the palace and the Royal Collegiate Church we tackle the Royal Gardens. Walking from the palace on to the terrace, we stop to take in the view. The garden slopes down from the terrace to what appears to be four or five majestically designed spaces. We later learn these are called axis. They differ and reach far into the distance and to the right. To our left the land slopes down dramatically at the end of the terrace. 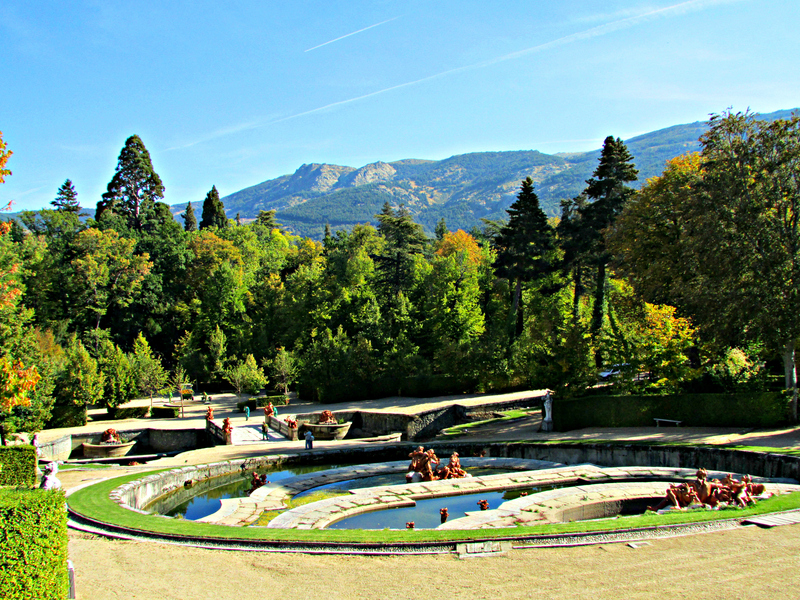 The Guadarrama Mountains provide an impressive backdrop for the garden. 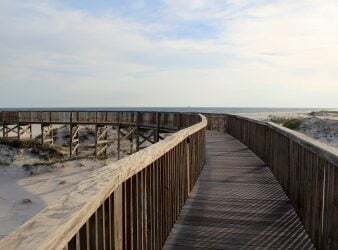 Although people stroll along the pathways, it is very quiet. The only sound comes from chirping birds. The future monarch spent much of his childhood at Versailles, his birthplace. We agree that in the garden we can see the influence of his time in France. With 26 sculptural fountains, numerous statues, marble benches, and urns, there is a French look and feel. 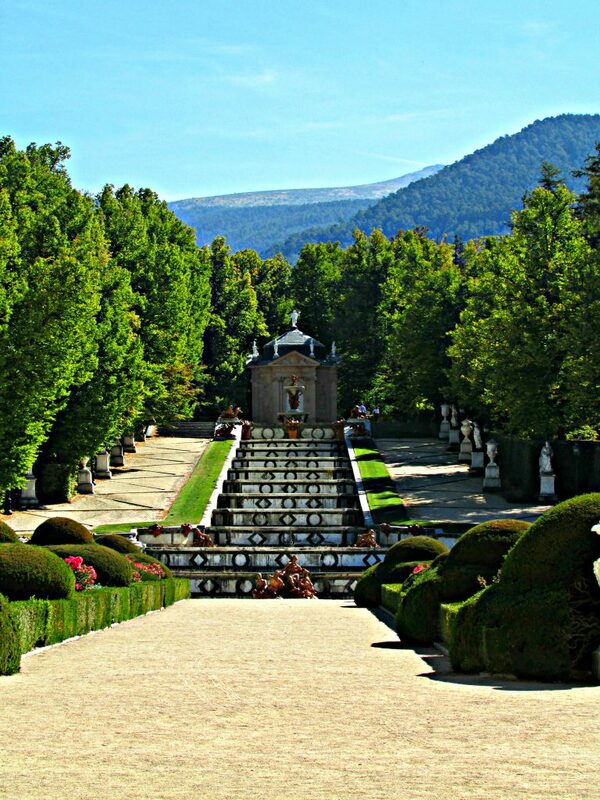 The garden includes a maze, at 607 hectares (1500 acres), perfect for a Spanish Monarch. The King hired the French architect Rene Carlier to design his garden. It could not have been an easy task. While a visually stunning location, the upward slope of the land toward the palace had to be factored in. 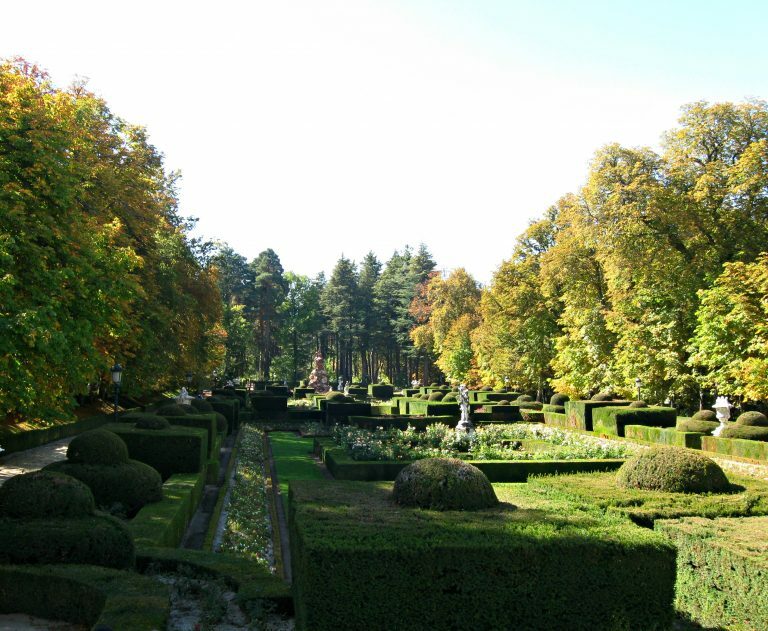 Carlier used it to his advantage by designing a formal garden with adjoining parallel axis. Everything is original to the Monarch’s time with one exception. 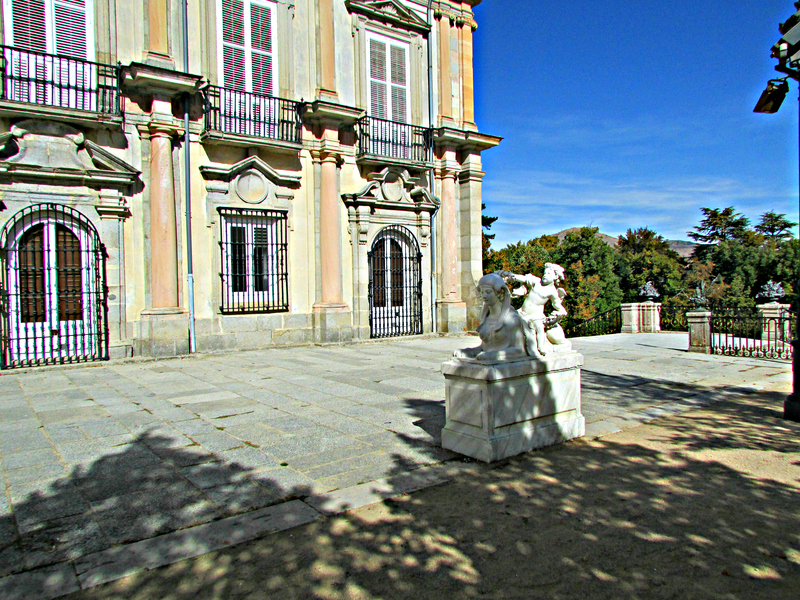 Charles IV ordered 28 marble urns moved to the Royal Seat of Aranjuez. He then replaced these with lead urns painted to look like white marble. We discovered that twenty four of the original urns still remain in Aranjuez. You can find the other four at the Royal Palace in Madrid. A garden fit for a King required an incredible amount of water. La Granja has seven reservoirs which hold water from the mountains. Miles of original pipes make up the hydraulic system which allow the jets of water from the sculptural fountains to shoot toward heaven. Gravity alone pushes the water without the use of pumps. I find this amazing considering the highest jets shoot to 130 feet. 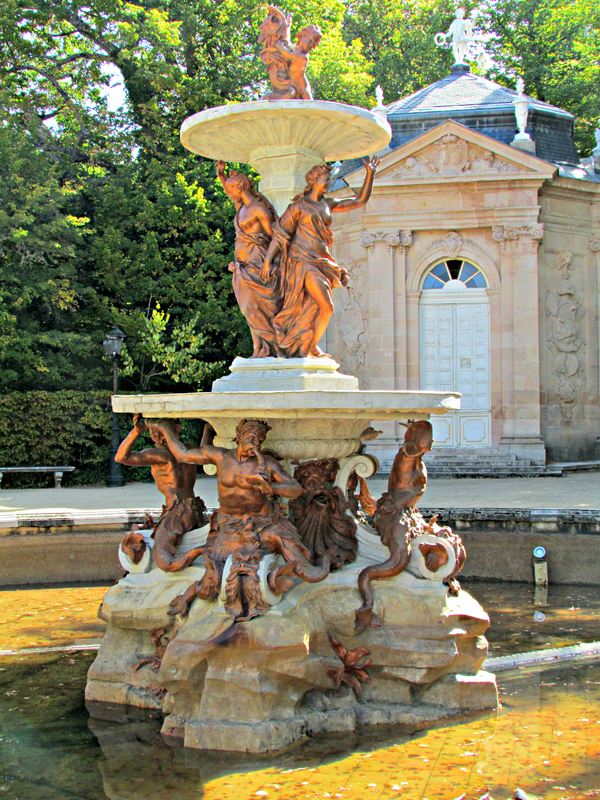 The King hired two well-known French artists to create the mythological based sculptural fountains that would be the highlight of his garden. Both Rene Fremin and Jean Thierry created sculptures for Versailles and were able to put together a ‘dream’ team of craftsmen. 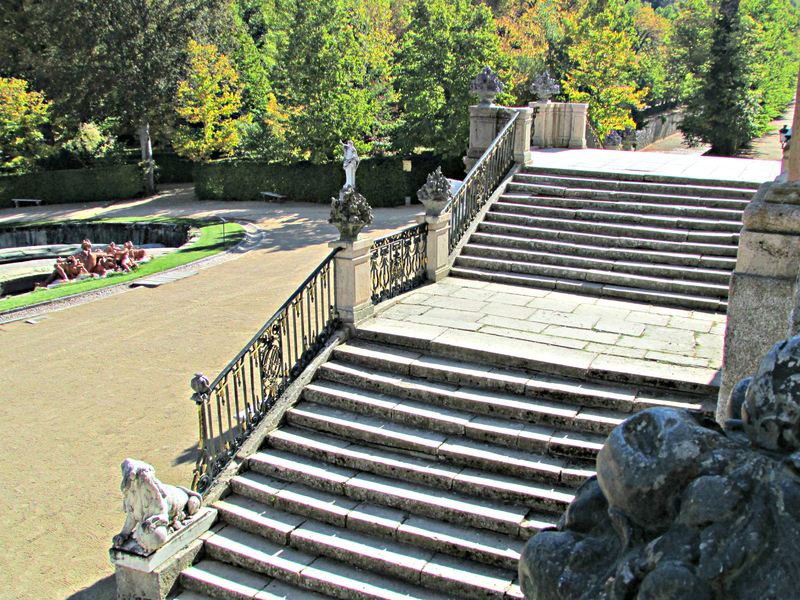 They also created the urns, marble sculptures, and benches throughout the garden. Their studio was located close to the palace. 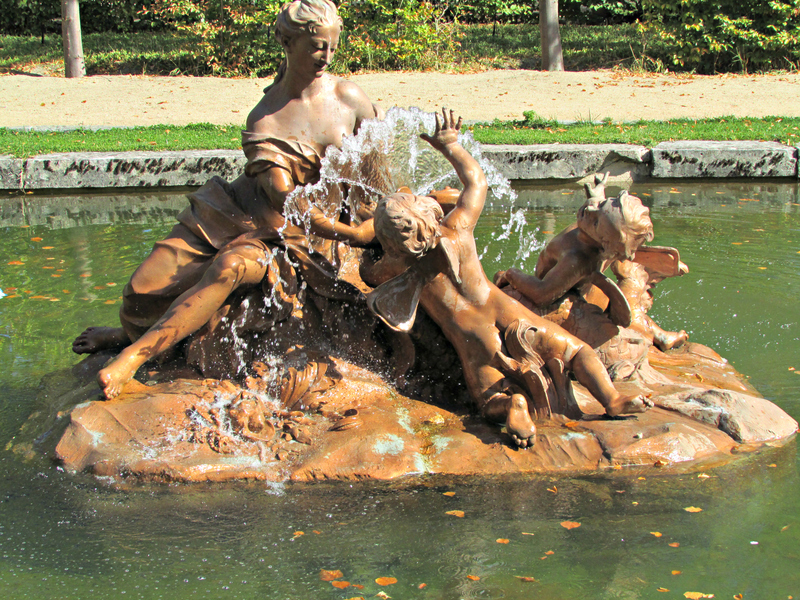 We were surprised that the sculptures for the fountains were cast in lead and an application of bronze varnish was then applied making it appear as if they were cast in bronze. The fountains do not operate daily. In fact, the entire collection operates a few times a year in July and August. A guard tells us that some fountains operate on the weekends for short periods of time. Having visited mid-week, I respond that we’ll be back to see them someday…to see all of them operating. The center of the Royal Gardens is the Palace Parterre. This formal garden lies opposite Juvarra’s facade of the palace. The King viewed the garden when looking out from the balcony of his bedroom. I feel fortunate to have viewed it from there as well. 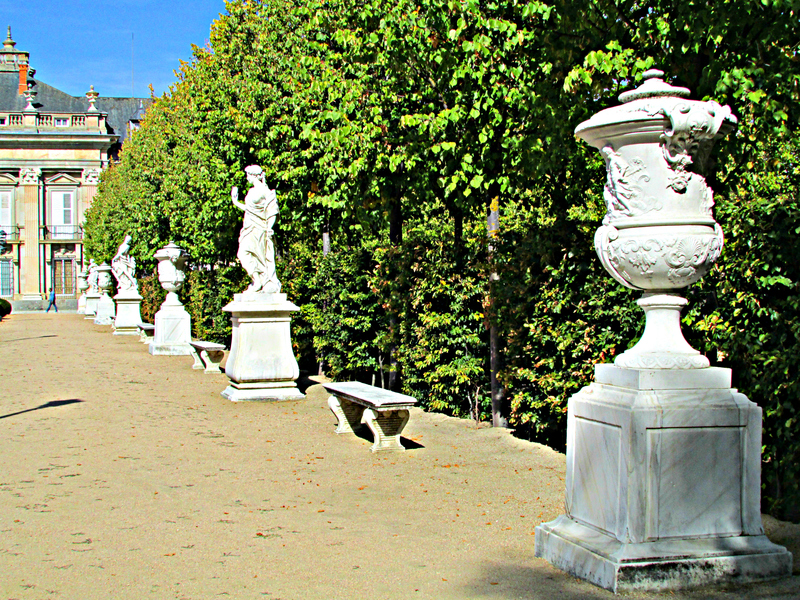 While formal in layout, the Parterre welcomes you with its marble benches, statues and the lead urns painted to look like white marble. Walkways on each side, as well as groves of trees, provide shade. Directly in front of the Parterre, the Axis of the New Cascade captivates us with its cascading fountains. I visualize the water rising from the fountains and cascading down the tiers to the reflecting pool with its sculptural fountains. We step over to The Fountain of the Three Graces which sits in front of the Marble Summer House. We are impressed by the delicacy of the sculpture and the stateliness of the Marble Summer House made from rose pink limestone. The King certainly knew how to choose the best to execute his vision. Left of the Palace Parterre is the Axis of the Horse Race. This immense section sits on varying levels which begin at the palace terrace. Marble steps link the levels. 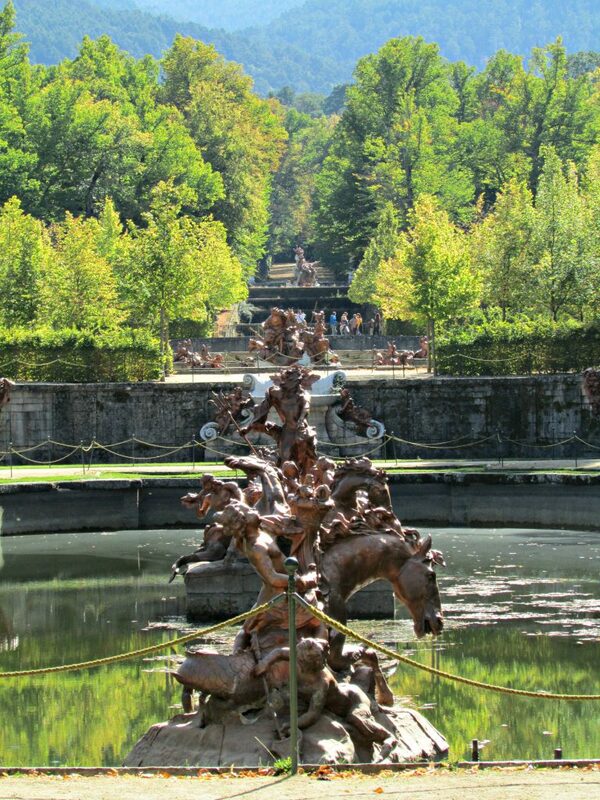 This axis houses a spectacular array of sculptural fountains and cascading ponds. Adjacent, very tall dense hornbeam hedges and trees form rooms. Peacefully strolling along this garden we stop at the top to gaze at the fountains below. What a magical sight this would be with the fountains operating. Walking down the steps we head back toward the palace terrace. Continuing to the end of the terrace we look over the small wall before going down the marble steps to the Axis of La Selva. A cascading pond leads to sculptural fountains below. Hornbeam hedges and sculptures embellish the side of the pond. Across a small bridge are the kitchen gardens and the intricate maze. While tempting, we decide to leave the maze for our next visit here. The Guadarrama Mountains and groves of trees provide a colorful background. Turning, we climb up the staircase to the terrace and walk down to the Axis of Fame. 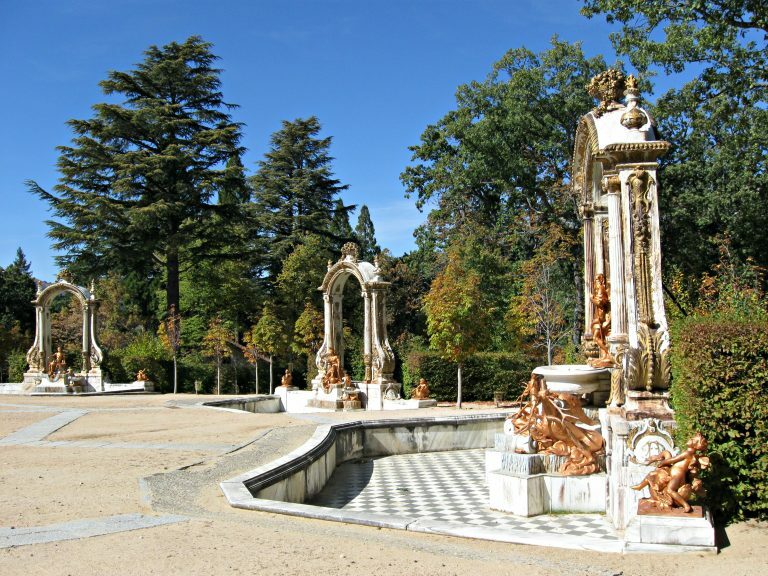 This section of garden contains Jean Fermin’s Fountain of Fame with its 130 foot jet of water. It sits in front of the Grove of Fame with its towering trees. Since the fountain is not operating, I try to visualize the spray of water rising up almost as tall as the trees. In front of the fountain is the Parterre of Fame, the greenest of the formal parterre gardens. 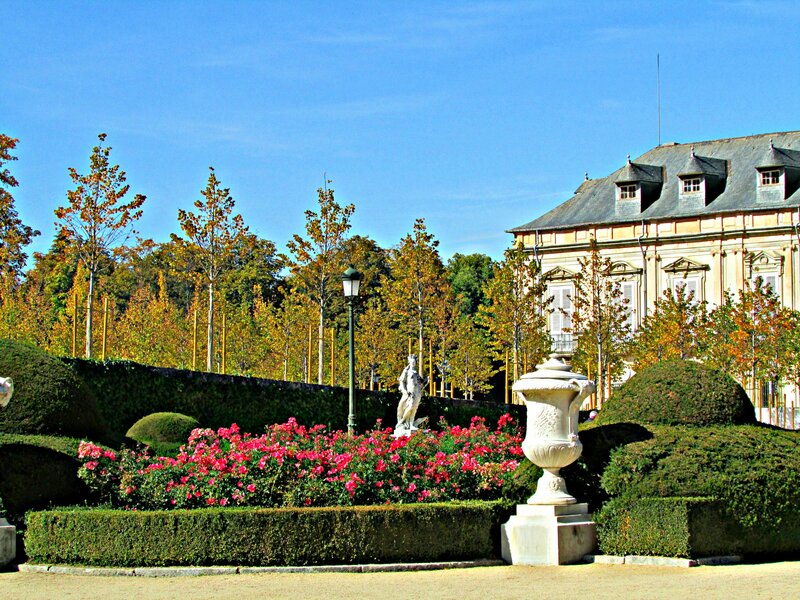 With perfectly manicured hedges, flower beds, large ornate urns, and sculptures, it takes my breath away. While we have had the palace gardens virtually to ourselves, that changed when we reached this axis. Everyone seems spellbound. A woman next to me says in English “this was the King’s favorite fountain and garden. He and the Queen would often come here.” I have to agree with the King. It is my favorite as well. At 1500 acres, we saw only a fraction of the garden. 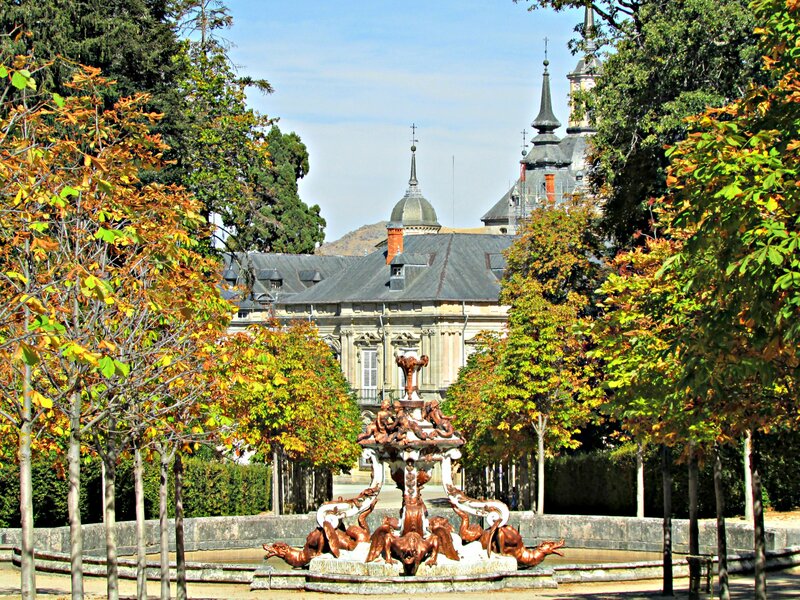 Walking through the gilded gates that lead out from the garden and in to town, we promise to return to the Royal Gardens of La Granja when the fountains are operating. Transportation: Taxis are available from Segovia and are a great time saver. Get a business card from the driver for pickup as taxis are difficult to find in San Ildefonso. There is limited bus service from Segovia. Also visit: The Royal Palace of La Granja and the Royal Collegiate Church, Plaza Espana 15, Tel +34 921 47 00 20. Admission 9E for the Palace, Church, and gardens. Allow ample time as there is so much to see. Royal Glass Factory of La Granja, Paseo Pocillo 1, Tel +34 921 01 07 00. Admission 5E. This museum is housed in a building from 1770. You will see how glass is made using the same 18th century techniques. Follow Barb Harmon on the first three stops of her tour of Spain. Well, this is almost overdone, considering for one person… Glad they don’t let the fountains run continuously as it is a waste of water. Yes, with a lot of power and wealth, you sure can create a paradise-like garden, using the available talents. For a lot of things nowadays it would be good for using the ‘heavy’ lead and paint it over to look like marble. Not that easy to haul off or destroy. It is funny how we mention Spain and France, being two separate countries but as the crow flies, it is not that far apart! Here in our vast nation we also do see influences from other states as craftsmen are being brought in or architects used from the same region. A wonderful location but considered for the early 18th Century the gap between extreme wealth and poverty was enormous. 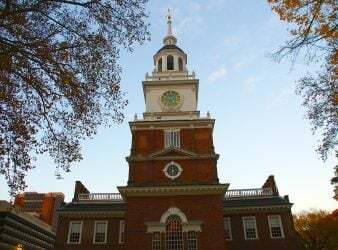 From our poor ancestors there are no buildings or statues left as they all had to support some royalty with heavy taxes in the form of wheat or whatever. The location is very clever of course and a moderate climate is always best for any garden. Happy Mother’s Day weekend to you and thanks for sharing! Thank you for your comment. As this was a four part series, the date is reflected in a previous article . When he purchased the property he was already planning on its execution. Cannot repeat everything in a series. The wonderful thing about the way the reservoir and water system was created, it is not wasted but recycled. I like that. Yes, there was an extreme between the very rich and the ‘regular or poor’ folk. Similar to what we see today. Dear Barb, there always is the chance that a reader just arrives at this part and it doesn’t take much to mention it again! A waste of water is also in regard to water being evaporated, if running the fountains ongoing. Recycling can only be done from the ‘clean’ part being used in the living areas. Anything being used for the gardens is being digested by plants, shrubs and trees as they take it all up.